Durham protests slam police repression | Fight Back! 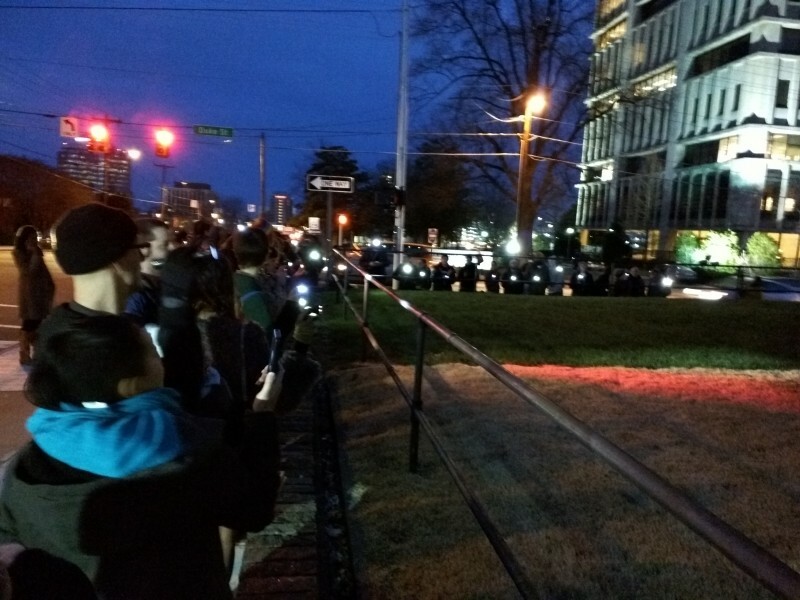 Durham, NC - About 60 people marched to the Durham police headquarters, Dec. 19, to protest attacks by Durham riot police on peaceful protesters in recent weeks. The march kicked off with the chanting of Assata Shakur's words, "It is our duty to fight for our freedom. It is our duty to win. We must love each other and support each other. We have nothing to lose but our chains!" In response to the lack of indictments of police in Ferguson, Missouri and New York in the deaths of Michael Brown and Eric Garner, organizers in Durham have led several demonstrations over the last month, the largest of which saw hundreds occupy the streets of central Durham for hours. In several of these demonstrations, Durham police have reacted with force and deployed riot police to suppress the protesters. Adding insult to injury, the Durham police chief has also blamed "outside agitators" for the way protests have unfolded in recent weeks. As a statement from SONG notes, "In response to a peaceful protest attended by hundreds of Durhamites and local university students, our police department dressed in riot gear, wielded nightsticks used to hit demonstrators at random, and deployed sound cannons. Several of the 31 people who were unjustly arrested on that night [Dec 5] also sustained injuries from being thrown to the ground, kicked, pinned-down, and otherwise roughed-up." 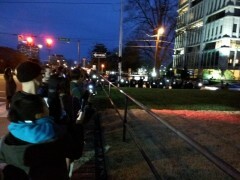 Standing outside the police station, protesters formed a line around both sides of the building and shined lights on the windows to show that Durham citizens are watching police and will not tolerate police violence. The protest came one day after about 50 people interrupted a city council meeting, denouncing the police attacks on protesters and demanding that city council take action. Some city council members have criticized protesters for violating city ordinances and protest rules. In a call and response at the city council meeting, protesters called out "Which side are you on? ", then named civil rights icons and revolutionaries - such as Rosa Parks, Assata Shakur, Bayard Rustin and Martin Luther King Jr. - and detailed their ‘crimes’ of blocking traffic, disrupting business as usual and breaking laws. The message was to point out, as Martin Luther King Jr. did, that "an unjust law is no law at all" and the real issue is not whether protesters block streets or highways, but that people want justice for Eric Garner and Michael Brown, and an end to police brutality, racist policing and political repression.